The New Orleans Musicians’ Clinic and its You Got This program will partner on a special event on Wednesday, August 29, to mark the thirteenth anniversary of Hurricane Katrina. 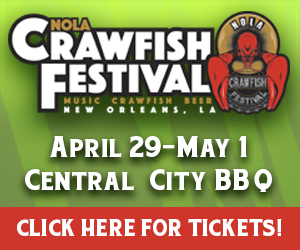 The focus of the event will be the the role music plays in mental health, particularly in relation to post-Katrina survival. According to organizers, “This innovative event blends music and performance as an expressive outlet and connector for navigating mental health issues.” Bethany Bultman, Co-Founding Director of NOMC says of the event, “I Will Survive is a celebration of the social connection, which helped so many of us overcome what we endured 13 years ago. We strive to create a compassionate, inclusive environment for our creative community to share stories and connect with one another– which can make a huge difference to an artist suffering from depression.” Earlier this summer, Bultman presented a call to action with the You Got This suicide prevention panel discussion at the International Performing Arts Medicine Association’s annual symposium at Chapman University, featuring recording artist James Blake, addressing the growing suicide epidemic in the performing arts community. Performers for the evening include Phil Degruy and Kei Slaughter. There will also be MCs, including Miss Reba Douglas and Leslie Cooper, RN. Ear acupuncture, an Eat Fit approved taco bar and more are also slated. 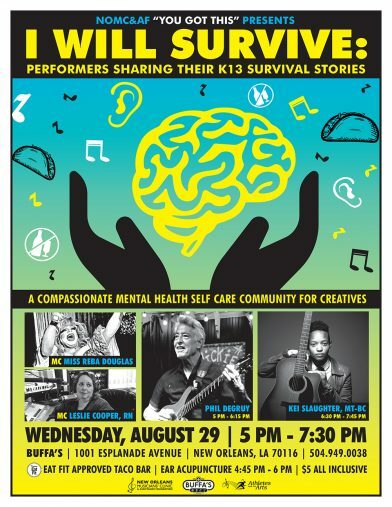 I Will Survive: Performers Sharing Their K13 Survival Stories takes place at Buffa’s from 5 p.m. to 7:30 p.m. For more information, click here.